This entry was posted in IT and tagged notizie on August 27, 2014 by FEMEN. This entry was posted in HU and tagged újság on August 27, 2014 by FEMEN. 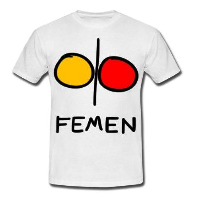 This entry was posted in NO and tagged nyheter on August 27, 2014 by FEMEN. This entry was posted in TR and tagged haber on August 27, 2014 by FEMEN. This entry was posted in RU and tagged новости on August 27, 2014 by FEMEN.